Clonazepam side effects have been known to include drowsiness, dizziness, fatigue, depression, memory problems and problems with walking and coordination. Use of this drug during pregnancy, especially during the first trimester, should be avoided at all costs, due to the potential for increased risk of congenital abnormalities. Women who are of childbearing age who are taking Clonazepam and could become pregnant must be warned of potential danger to the fetus. Mothers who are breastfeeding should also avoid taking Clonazepam, as it can be passed on to the baby through ingestion of the breast milk of a mother taking the medication. 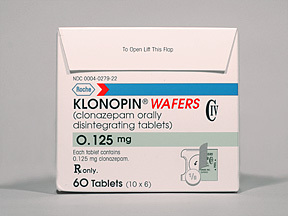 A benefit-risk evaluation of the side effects of Clonazepam on the patient should be performed by the supervising physician before prescribing long term use of this drug to pediatric patients for treatment of seizures or other conditions, because there are potential adverse side effects on juvenile physical and mental development. The effect and safety of Clonazepam on children under 18 with panic disorders have not been thoroughly evaluated, and therefore additional side effects for children could be possible. Weight gain and weight loss were reported during Clonazepam clinical trials; however, these are not common side effects. Changes in a patient’s basal body weight and body mass (BMI) during these studies show no trends toward either tendency. According to the majority of documented studies, less than 1% of patients reported problems with weight gain or weight loss while taking Clonazepam, indicating that these may not be actual side effects linked to this drug. Side effects also include feelings of being drowsy and dizzy and a demonstrated potential for impairment of fine and gross motor skills, judgment and progressive thinking. Patients are advised not to drive or operate machinery until they know how Clonazepam affects them personally. Withdrawal symptoms associated with taking Clonazepam can be severe and include worsening seizures, hallucinations, behavioral changes, uncontrolled shaking, cramps, anxiety and problems with sleeping. Patients, especially women and children, should be fully informed about potential side effects. Proper supervision by a medical professional is necessary while taking this drug, along with full disclosure of any medications or medical conditions by the patient. Clonazepam appears to be a safe and effective treatment for the conditions it is prescribed for, with minimal serious side effects.